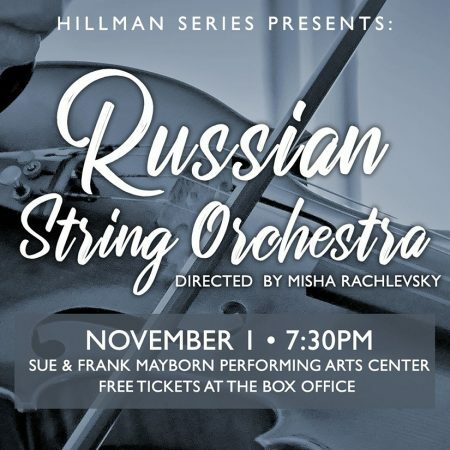 Belton, Texas – The University of Mary Hardin-Baylor will open its 2018 Hillman Visiting Artist Series on Thursday, November 1, with a performance by the Russian String Orchestra, accompanied by UMHB Professor of Piano, Michelle Schumann. The performance will begin at 7:30 p.m. in the Baugh Performance Hall of the Sue & Frank Mayborn Performing Arts Center on the UMHB campus. Admission is free, but tickets are required. The Russian String Orchestra will perform works by composers Dmitri Shostakovich, Pyotr Tchaikovsky, and Wolfgang Amadeus Mozart. Formerly known as the Chamber Orchestra Kremlin, the Russian String Orchestra was founded in 1991 and performs under the direction of Misha Rachlevsky. The orchestra is comprised of some of Russia’s finest young string players. The group is celebrated for the depth and variety of its repertoire, which includes more than a thousand compositions. Over the last three decades the Russian String Orchestra has performed in 25 countries throughout North and South America, Europe, and Asia. The group’s discography of over 30 albums has received widespread international acclaim, including the Diapason d’Or award in France, Critics Choice in London’s Gramophone, and Critics Choice in The New York Times. Tickets can be ordered online from the Sue & Frank Mayborn Performing Arts Center website or from the center’s Box Office. Box Office hours are Monday to Friday from 1:00 to 4:00 p.m. and one hour prior to the event. For more information call (254) 295-5999.